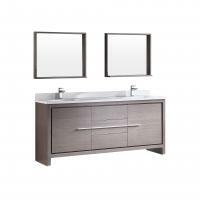 The great size of this piece allows for plenty of functionality with the counter top area and storage spaces, while the wall mounted style lends a spacious feeling to the bathroom. 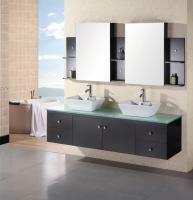 For each user there is a double door cabinet that includes an interior shelf. The three open shelving areas make perfect spots for bathroom essentials as well as decorative items. 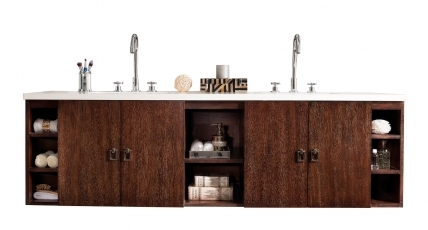 This model has a coffee oak finish that shows off the natural beauty of the wood grain. The hardware pulls have a brushed nickel finish and are made into a distinctive rectangular shape.